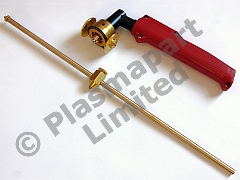 Wheeled cutting guide and circle cutter suitable for use with the SG 55 torch. At last, a wheeled cutter guide for the SG 55 / AG 60 / WSD 60P Torch!! This is a well made from machined brass. The guide is supplied complete with a circle cutting bar so can cut accurate circles in metal plate. The PT 31 torch head shown is not included but is available from our shop.